We Are Able to Provide Diseased Tree Diagnosis In Order To Offer the Best Treatment for Your Tree. Have you noticed that the trees in your backyard aren’t looking so good? Just like any other living thing, trees need proper upkeep and healthcare in order to survive and thrive. 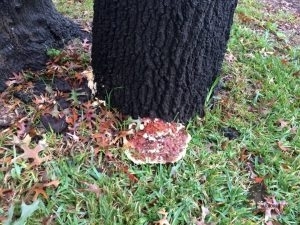 Trees can become susceptible to diseases just like humans, so if you notice that your trees look a little worse for the wear, contact Fort Worth Arborist Co.. Our arborists are able to tell if your tree is sick or diseased with proper and professional tree disease diagnosis in Fort Worth, TX. If you are concerned about the health of your tree, call us at 817-975-0180. We can provide accurate and affordable treatment to get your residential or commercial trees and shrubs back in great condition. In terms of diseases, trees have two categories infectious and non-infectious. Infectious is usually caused by bacteria or fungi, whereas non-infectious is caused by lack of nutrients or compacted soil. Knowing the signs of tree disease symptoms can better help you save your tree. Some of the most common tree disease signs are discolored leaves, premature defoliation, unusual leaf shapes, fungal growth on roots and tree trunks, dead or dying limbs and stems, and cankers on the bark. If you are still unsure if your tree is truly sick, don’t hesitate to call us! Our arborists are able to evaluate the structure of your tree and determine if your tree is indeed sick or diseased. We can provide analysis on the tree tissue and soil to verify if the tree is in fact diseased. The most typical diseases that we see in Texas trees are Hypoxylon Canker, Oak Wilt, Fire Blight, Tip Blight, Bacterial Leaf Scorch, Root Rot, and Anthracnose. Based on what type of disease your tree has will depend on what type of treatment is needed. If the tree is too far gone, we will suggest removal. No matter what the tree disease diagnosis is for your Fort Worth, TX tree, we will be sure to do whatever we can to save it. One of the best ones to preserve the life of your tree is with yearly tree maintenance. With maintenance, we can provide healthcare for sick trees before they get any worse. If you think that you have a diseased tree in your home’s backyard or in the front of your business, please call Fort Worth Arborist Co. for sick tree help. We can provide thorough and expert inspection and analysis to come up with the tree disease diagnosis for your Fort Worth, TX tree. From there we will come up with a treatment plan that is best suited to the stage of the disease your tree is in. Call us at 817-975-0180 to schedule your diagnosis, consultation, or inspection today! Updated on July 25, 2018 at 11:10 am by Fort Wort Arborist Co..